Our mission is one embraced and supported across our whole community. Sound like fun? Get Involved! To advance our historic, waterfront destination by enriching the lives of residents and visitors through art, entertainment, cultural and business opportunities. Downtown Cambridge is a nonprofit volunteer organization that brings businesses, jobs, customers, and entertainment to the core of our community while staying true to our town’s rich history. 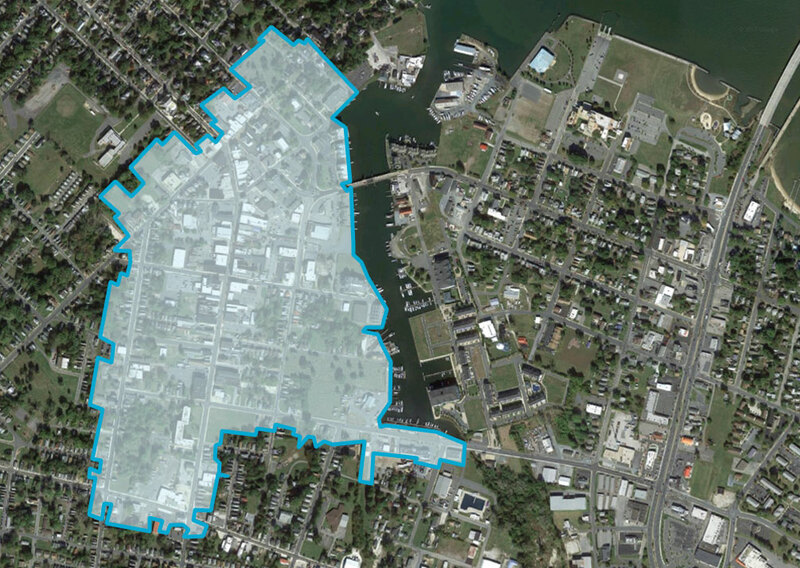 What area makes up the district recognized as Downtown Cambridge? This map offers general guidelines, but to be certain whether your business falls inside our designated Main Street district, please reach out to office@cambridgemainstreet.com for more information and to take advantage of the wealth of resources we have to offer our local business owners. The approach we take follows the “Main Street” model of economic development developed by the National Trust for Historic Preservation. Now in place in more than 1,000 communities around the country, it’s geared especially toward historic downtown districts that hit upon hard times when shopping malls, big box stores, and chain restaurants came to dominate the dining and retail sectors. The Business Development Team works to bolster business activity downtown by strengthening existing businesses and attracting new businesses. In 2011, our volunteers were honored for the Best Business Development Project of the year among Maryland’s 23 Main Street Communities! The Market & Promotions Development Team works to build downtown’s customer base via marketing efforts, promotional campaigns, special events and other strategies. Key Events such as Taste of Cambridge, Groove City Culture FEST, Blues, Brews & BBQs, & Second Saturdays. This team also oversees Co-Operative Marketing programs and brand & message development. The Streetscape Development Team works to make downtown Cambridge a more beautiful, inviting, and environmentally sustainable place to spend time. In 2010, our volunteers received the statewide Community Activism and Achievement Award from the Governor’s Office of Smart, Green & Growing! The Organizational Development Team works to bring in the financial resources and volunteer expertise that Cambridge Main Street needs to help our community achieve its goal of a fully revitalized downtown district. In 2010, our volunteers were honored for the Best Organizational Development Project of the year among Maryland’s 23 Main Street Communities. All four teams are led and staffed by community volunteers. Here’s where you can find out more about volunteer opportunities at Downtown Cambridge. The Main Street model is working in Cambridge. The shops and restaurants in our downtown have garnered numerous awards and won increasing media attention in recent years as this revitalization gains momentum. It’s happening in large part because of the generosity of our donors and the work of our volunteers. Ms. Clendaniel has an academic background in historic preservation and cultural anthropology with a focus on local Eastern Shore environmental and heritage issues. She has been working professionally in the community and economic development field since 2010 serving the Town of Easton, Delmarva Community Services, and Dorchester County Tourism. She has served the Downtown Cambridge organization since 2007 as a committee volunteer, board member for a short time, and now as Executive Director. Ms. Clendaniel has also served on the City of Cambridge Historic District Commission design review committee, the Choptank Heritage Trail Board of Directors, and is a past two term member of the Shore Leadership Alumni Executive Committee.